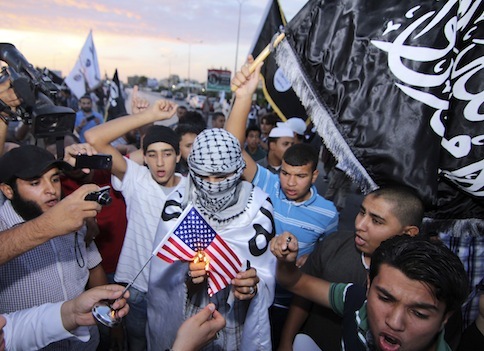 The State Department designated three branches of the group Ansar al-Sharia as foreign terrorist organizations on Friday, including two branches that officials said were involved in the Sept. 11, 2012, attacks on the U.S. diplomatic compound in Benghazi, Libya. Ansar al-Sharia’s branches in Benghazi, Darnah, and Tunisia were declared "foreign terrorist organizations" and "specially designated global terrorist entities" and will now be subject to prohibitions on outside support and freezes of U.S. assets. The leaders of the three branches—Ahmed Abu Khattalah, Sufian bin Qumu, and Seifallah Ben Hassine, respectively—were also labeled as "specially designated global terrorists." The source of the Benghazi attacks has been a matter of contentious debate. U.S. officials originally said the assault was spontaneous and in retaliation of an American-made video disparaging Islam, but evidence later surfaced that terrorists photographed the diplomatic compound beforehand and were equipped with assault rifles, rocket-propelled grenades, and mortars. The Washington Post reported on Tuesday that Qumu, leader of the Ansar al-Sharia branch in Darnah and a former Guantanamo Bay detainee, participated in the Benghazi attacks and was trained in 1993 at one of al Qaeda leader Osama bin Laden’s terrorist camps in Afghanistan. However, State Department spokeswoman Jen Psaki maintained on Wednesday that the Ansar al-Sharia groups are not "official affiliates of core al Qaeda." The State Department also announced a reward of up to $10 million for information that would assist the investigation of the Benghazi assault, adding that it "remain[s] committed to working with the Libyan government to bring the perpetrators of the Sept. 11, 2012, Benghazi attacks to justice." Psaki told reporters in November that they would "have to take the word of the United States government" that Benghazi suspects were added to the rewards program after no documentation was provided. A controversial report by the New York Times last month said there was "no evidence that al Qaeda or other international terrorist groups had any role in the [Benghazi] assault" and that it was "fueled in large part by anger at an American-made video denigrating Islam." This entry was posted in National Security and tagged Al Qaeda, Ansar al-Sharia, Benghazi. Bookmark the permalink.